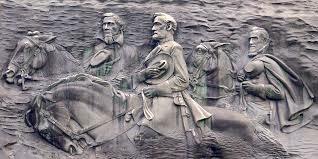 The president of the Atlanta NAACP says the group wants Confederate symbols — including a giant carving at Stone Mountain Park — removed from all government-owned property and plans to pursue making those changes during the next legislative session. Some who support flying the battle flag say the symbol represents Southern heritage and pride in Civil War-era leaders. However, Atlanta NAACP President Richard Rose and others have argued the flag is a divisive symbol and white supremacy is at the heart of the heritage the flag celebrates.